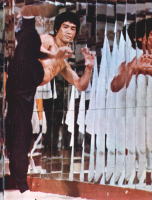 Indisputably the greatest modern exponent of the deadly Chinese martial art Kung-Fu, Bruce Lee was the man with the golden punch. A new kind of screen idol with millions of fans the world over. 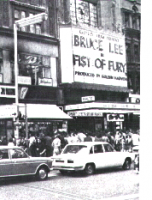 To Chinese everywhere Lee was a Messiah, an oriental Muhammed Ali, restoring national pride in a shattered heritage. 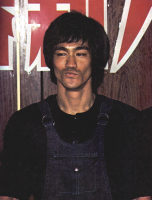 But to his numerous enemies and rivals, Bruce Lee was an arrogant punk, consumed by a colossal ego and an overwhelming ambition to succeed. 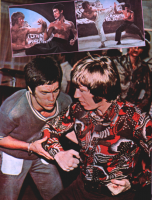 Teenage gang leader, glittering superstar, devoted husband, health fanatic, teacher, philosopher, prophet, lover, friend ... Lee was all of these and more. Had he lived he would undoubtedly have become the highest paid actor in world cinematic history. "To tell you the truth", he once said; "l could beat anyone in the world." In life, Lee was an inspiration to tens of thousands of young disciples. In death, a celluloid enigma, shrouded in a web of ugly scandal and mystery. How could the 'Fittest man in the world' have died at only 32? What inner forces drove him to perfect his ancient art? 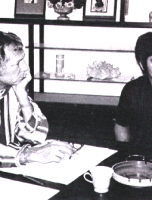 Who really was Bruce Lee? Fully researched and lavishly illustrated with dozens of exclusive photographs, this book tells the almost unbelievable story of a man who truly became a legend in his own time.